Prime Minister Lee Hsien Loong has expressed his worries of two new ‘societal trends’ among some ‘vocal’ Singaporeans: A ‘self-centred’ Not-In-My-Backyard syndrome and what appears to be a growing gap between Singaporeans and new immigrants. Speaking to the Singapore media at the end of the 20th Asean Summit in Phnom Penh, he raised his concerns about these two trends which has led to an increasing outpouring of anger and frustration against the government in cyberspace. “We should not, because of one incident, make that into an issue, (to say) all immigrants are like that,” he said. Despite the gravity of his offence, Sun Xu was only given a $3,000 fine and a 3-month community service obligation. Unlike two Singaporean students who were expelled immediately by their Junior College for kissing publicly, Sun Xu will be allowed to graduate from NUS next year. The government introduced a $10-million dollar Community Integration Fund two years ago to help make the newcomers feel welcomed, accepted and happy in Singapore. Judging from the response of Singaporeans so far to the Sun Xu saga, there is still a long way more to go. Embattled NUS PRC scholar Sun Xu reportedly had a job interview cancelled yesterday as news broke out about his ‘punishment’ by NUS for breaching its ‘Code of Conduct’. 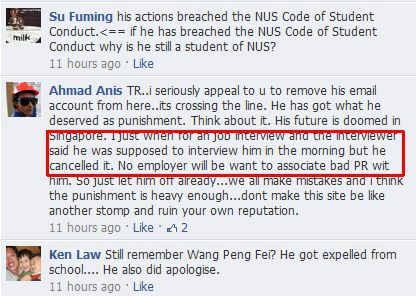 Despite the gravity of his actions, he was let off the hook by NUS with a fine of $3,000, a 3 month community service obligation and termination of his scholarship benefits for his final semester only. However, the repercussions of his offensive remarks may already be felt now as potential employers continue to shun him after German company Schlumberger reportedly terminated his attachment with it prematurely. Though Sun Xu may encounter difficulties finding a job in Singapore at least in the near future, he can easily find one back home in China as Singapore graduates fluent in both English and Mandarin are in great demand there. One ex-NUS PRC scholar Xin Ping has written to us asking for Sun Xu contacts and offering him a position with her company in Shenyang, the capital of Liaoning province in Northeast China. Given his present predicament, Sun Xu should consider leaving Singapore for good and return to China where there are more ‘humans than dogs’ unlike here. 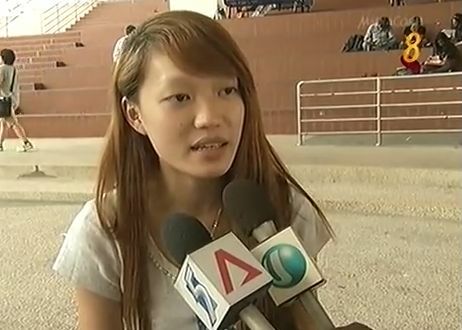 Channel 8 also interviewed a few NUS students who felt Sun Xu should be held responsible for his comments made online. Poll: What do you think of Sun Xu’s punishment? “I would like to highlight the fact that Sun Xu was imported in the year 2005, not 2006 as you pointed out. As I belong to the Class of 2006, I feel disturbed to be seen as his peer then. Now with Sun Xu being let off the hook by NUS, he can graduate happily in July this year and look back at his seven years of FREE EDUCATION in Singapore with delight and glee. 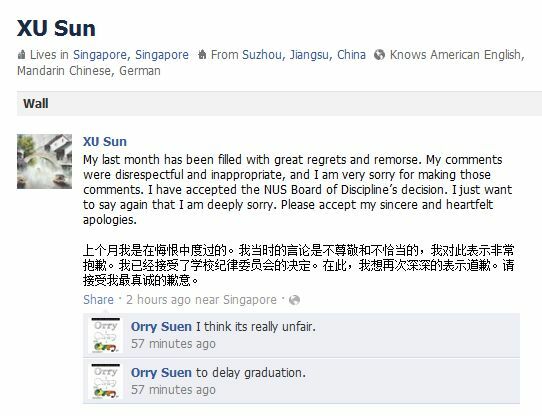 Embattled PRC scholar Sun Xu has apologized for a second time to Singaporeans on his Facebook shortly after NUS announced his ‘punishment’ for breaching its Code of Conduct. In a circular issued to the NUS community today, NUS Provost stated that Sun Xu will be ‘reprimanded’ and fined $3,000 for posting offensive remarks about Singaporeans online. He will also have to serve three months of community service after which he will be allowed to graduate. 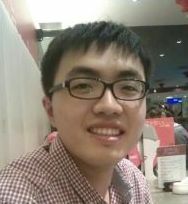 Though Sun Xu’s MOE scholarship was not revoked, his undergraduate benefits for the final semester will be suspended. “I think it’s really unfair to delay graduation,” Suen wrote. Sun Xu still has two weeks to appeal against the decision made by NUS Board of Discipline and he has not indicated if he would do so yet. Meanwhile, the controversial verdict sparked another round of outcry from netizens as they lampoon NUS for lacking the ‘balls’ to expel Sun Xu. Last month, one of our students, an undergraduate at the Faculty of Engineering, posted offensive remarks about Singaporeans online. He has since been counselled and has apologised unreservedly. 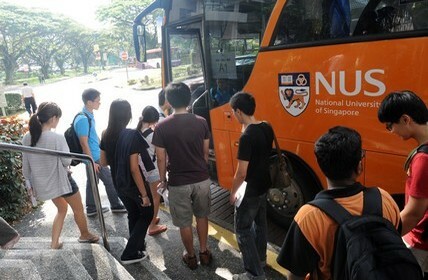 As the student had acted in a manner that was detrimental to the reputation and welfare of the university community, his actions breached the NUS Code of Student Conduct. A Board of Discipline was thus convened. The Board of Discipline has ruled that his remarks were improper, insensitive and disrespectful to the community. The remarks had also stirred up considerable unease, distrust and ill-will within and beyond the university community. The Board of Discipline’s decision sends a clear and strong signal that the University does not condone such actions. At the same time, as the administrator of his scholarship, the University has separately conveyed to him that his undergraduate scholarship benefits have been terminated for the final semester as his behaviour was unbecoming of a scholarship holder. Beyond these decisions, it is hoped that the student will be able to learn important lessons from this incident and from the subsequent community service attachment. This incident is a regrettable one, but it serves to remind us of the conduct we collectively expect all members of this community to uphold. It provides us with an opportunity to reflect on the nature and tenor of dialogue and discussion which a respected and learned community should embrace, and reminds us that postings of offensive and disrespectful remarks on social media, forums and websites are inappropriate. As a global university, we thrive best in an open and diverse environment in which people from all walks of life, as well as different communities and countries, can learn from one another, with mutual respect for each other. We are glad that the vast majority of the NUS community embraces this. In particular, we look to our students, as responsible and rational young adults, to uphold our values as a learning community, and in the process, to make the University and your families proud. Despite the harsh rhetoric, the National University of Singapore (NUS) never intended to practice what it preached by expelling its ‘beloved’ MOE PRC scholar Sun Xu for breaching its own Code of Student Conduct. It added that after ‘careful consideration’, it has decided to impose a $3,000 fine on Sun Xu on top of a community service obligation for three months after which he may be allowed to graduate, but stopped short of expelling him from NUS as many has hoped for. Unfortunately, the signal sent by NUS was neither clear or strong. 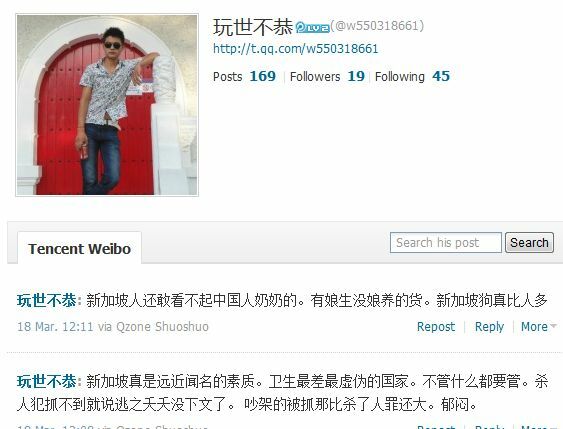 When a PRC student Wang Peng Fei posted self-made videos online making racist remarks about minorities in Singapore, he was immediately sacked by the East Institute of Management where he was a student. 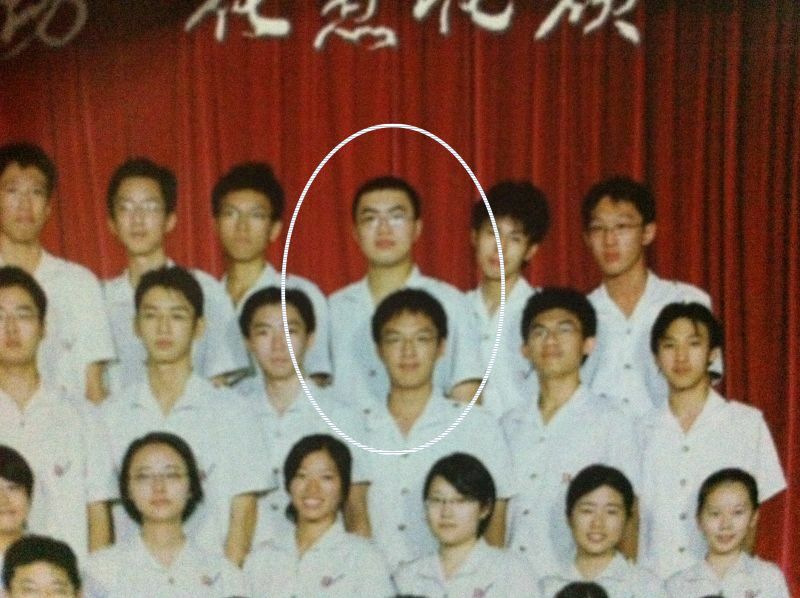 Sun Xu’s case is even more serious than Wang Peng Fei as he is a recipient of a MOE scholarship which pays for all his tuition fees and living expenses since 2002 when he came from China to study in River Valley High School. Not only was he expressing contempt for the very people who have been supporting him, he did not show any appreciation or gratitude for what Singapore has given him so far. A disciplinary committee of National University Singapore (NUS) has found MOE PRC scholar Sun Xu guilty of breaching its Code of Conduct, but stop short of expelling him from the university, according to a circular we obtained from the Provost Office of NUS. Instead, he was fined a mere $3,000 for posting offensive remarks about Singaporeans online. Sun Xu has also been ordered to perform 3 months’ of community service and ‘reprimanded’ for his actions which has brought NUS into disrepute. The case received extensive coverage in both the mainstream and new media and put MOE’s long-standing policy of giving generous scholarships to foreigners under intense public scrutiny. Since NUS did not expel Sun Xu, he will naturally be able to keep his MOE scholarship and graduate from NUS in a few weeks’ time, after which he will probably jet off from Singapore for good. Barely one month has passed since NUS PRC scholar Sun Xu caused a near nationwide outrage with a dig at Singaporeans, another PRC man has followed his footsteps into infamy. He also attacked Singapore for being a well-known ‘inferior product’ and described the standards of public hygiene in Singapore as being ‘deplorable’. It is not known if “玩世不恭 is living in Singapore or China. In any case, his views do reflect the mentality of a certain proportion of mainland Chinese who continue to have a ‘superiority complex’ emanating from their ‘5,000 years of civilization’ and despise Singaporeans as their ‘lesser brethren’.